Ethopia (the Federal Democratic Republic of Ethiopia) is a landlocked country located in the Horn of Africa (in the East of that continent). The country shares landborders with Djibouti, Eritrea, Kenya, Somalia, South Sudan, and Sudan. Ethiopia is the 2nd most populous country in Africa (after Nigeria). As of 2008, the country's population was estimated as 79.2 million. 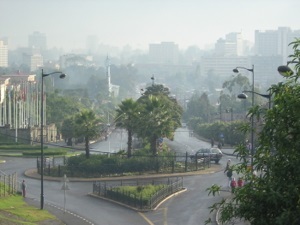 The national capital and largest city is Addis Abba. Around 3.4 million people live in the city, with a further 1.2 million in the city's metropolitan area. 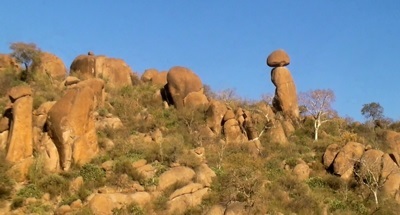 The city lies at the foot of Mount Entoto, in the center of the country. 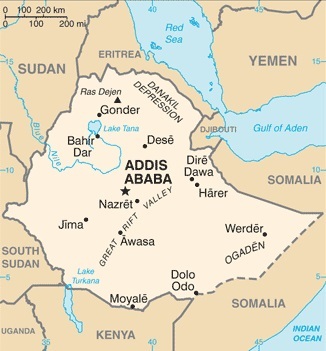 The lowest parts of Addis Abba are 7,631 feet (2,326 meters) above sea-level, and parts of the city rise to over 9.800 feet (3,000 meters) above sea-level. Thebestselling guide to Ethiopia in recent years, this fully updatedseventh edition of Philip Briggs' acclaimed guide reveals an ancient countrythat continues to surpass all expectations: from the ancient Judaic cultures ofthe fertile highlands to the Animist people of the South Omo Valley, from theAfroalpine moorland of the Bale Mountains National Park to the thundering BlueNile Falls. This book also leads you further off the beaten track, sotravelers can see more of this expansive and beautiful land, believed to bethe cradle of humankind. Joanna Lumley, OBE FRGS, says:- an absolutely stunning book, it has made me think of all I missed and reinforced my determination to return to Ethiopia, the book is a masterpiece, a masterclass on what every handbook should be. Ethiopia - Travellers' Handbook is a book conceived for the discerning traveller, the package tourist and those people wishing to have a quick reference guide with a range of facts at their fingertips. The book provides a clear understanding of what there is to see and do in Ethiopia. The background and reference information conveys a wide-ranging view and it has been designed to be uncomplicated and straightforward to use, without having to constantly refer to abbreviations and symbols. It is a travel guide with a user-friendly presentation that allows quick reference to topics of interest. The many map illustrations have been designed to be uncomplicated and easy to follow. The book, which is full colour throughout, is packed with information, images and illustrations. As well as people, places and fauna, the book covers many aspects of Ethiopia including myths, history, development, political history, topography, Ethiopian Orthodox Church, language and reference data. Colonel John Blashford-Snell OBE, one of the greatest travellers and explorers of our time, has written the foreword. Other prominent organisations and people have contributed articles illustrating their exciting and heart-warming involvement with Ethiopia that are intended to further inform the traveller. The book contains completely independent travel advice. The Perfect Choice: Lonely Planet Ethiopia & Djibouti, our most comprehensive guide to Ethiopia and Djibouti, is perfect for both exploring top sights and taking roads less travelled. Lonely Planet Ethiopia, Djibouti & Somaliland is your passport to all the most relevant and up-to-date advice on what to see, what to skip, and what hidden discoveries await you. Explore the crooked alleyways of Harar, gape at the rock paintings of Las Geel, or experience the calcareous chimneys of Lac Abbe; all with your trusted travel companion. Get to the heart of Ethiopia, Djibouti, and Somaliland and begin your journey now! The Perfect Choice: Lonely Planet Ethiopia, Djibouti & Somaliland, our most comprehensive guide to Ethiopia, Djibouti, and Somaliland, is perfect for those planning to both explore the top sights and take the road less travelled. Looking for more extensive coverage? Check out Lonely Planet's Africa guide for a comprehensive look at all the continent has to offer. Authors: Written and researched by Lonely Planet, Jean-Bernard Carillet, Tim Bewer & Stuart Butler. The Perfect Choice: Lonely Planet Ethiopian Amharic Phrasebook & Dictionary, a pocket-sized comprehensive language guide, provides on-the-go language assistance; great for language students and travellers looking to interact with locals and immerse themselves in local culture.